If Deutsche Bank is trying to remove itself from scandalous headlines, it’s not doing a very good job at it. The German language newspaper, Handelsblatt, reported yesterday that Special Counsel Robert Mueller has subpoenaed bank records from Deutsche Bank relating to President Trump and his family members. Handelsblatt writes that “The former real-estate baron has done billions of dollars’ worth of business with Deutsche Bank over the past two decades, and First Lady Melania, daughter Ivanka and son-in-law Jared Kushner are also clients.” The central focus of the Mueller probe is the Trump campaign’s involvement with Russia. One common link between Deutsche Bank and the Trump family is Vnesheconombank (VEB), a Russian state-owned bank which has been under U.S. sanctions since July 2014 for Russia’s annexation of Crimea and aggression in Ukraine. Jared Kushner, Trump’s son-in-law, held a December 13 meeting with Sergey Gorkov, Chairman of VEB. In an exclusive investigation on May 30, Wall Street On Parade reported that despite the U.S. sanctions against the state-owned bank, various Deutsche Bank mutual funds that operate in the U.S. own tens of millions of dollars of VEB debt securities. Other major U.S. mutual funds also own tens of millions of dollars of VEB debt. That is apparently owing to the fact that the sanction order prohibited “new financing” to VEB but was silent on what banks should do with the hundreds of millions of dollars of VEB securities already in their portfolios. Deutsche Bank has a long history of running afoul of U.S. regulators and the U.S. Department of Justice. This past January the U.S. Justice Department announced a $7.2 billion settlement with Deutsche over its illegal issuance of mortgaged backed securities and shoddy lending practices. The settlement consisted of a $3.1 billion penalty and $4.1 billion in relief to those impacted by its illegal actions. The Statement of Facts released by the Justice Department at the time of the settlement included the text of what those inside the bank knew about the fraud as it was occurring. Also this past January, U.S. and U.K. regulators reached a $630 million settlement over Deutsche’s so-called “mirror trades” that were referenced in the letter by Congresswoman Waters and used to launder $10 billion out of Russia. The bank paid $425 million to the New York Department of Financial Services and approximately $205 to the U.K.’s Financial Conduct Authority (FCA). 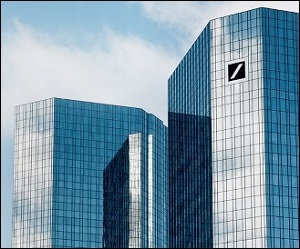 In April 2015, Deutsche Bank entered into a deferred prosecution agreement with the Justice Department over wire fraud and antitrust charges related to its role in manipulating U.S. Dollar LIBOR and engaging in a price-fixing conspiracy to rig Yen LIBOR. (LIBOR is an interest rate benchmark used to set rates on everything from credit cards to mortgages.) At the same time, a bank subsidiary pleaded guilty to wire fraud for manipulating LIBOR. The tab to Deutsche Bank was $775 million in criminal penalties. Correction: The article has been updated to correct the spelling of Maxine Walters to Waters.